Are Wooden Toys More Educational? There is a long-standing debate on this topic. One side claims that toys made from wood are more educational for your children. They reason that if it is less stylized it leaves more to the imagination. The other side contends that the material alone doesn’t automatically make a toy have educational value. That would be like saying foods with the color green are healthier. Jelly Belly, Jolly Rancher, Green M&M’s — you get the picture. We tend to agree with the latter argument. Many of us at QUADRO grew up playing with LEGO. It’s made of plastic, and yet one could argue that no other toy has inspired so many children’s imaginations in quite the same way. It is, in fact, not the material that counts but its function. Construction toys, whether made from plastic or wood, offer the most educational and creative learning experience, the benefits of which last a lifetime. They appeal to both boys and girls of all ages, offering open-ended play in which the imagination is the limit. QUADRO is no exception to this — a Giant Construction Kit with endless possibilities for creation and problem solving. And it is only possible thanks to advancements in plastics. Wood is commonly thought of as being the “natural choice” for children's toys. However, this is not automatically the case as not all wooden toys are created in the same way. Toy manufacturers often use clever marketing to make parents believe that they are buying natural toys. Packaging may state, “this toy is made from wood”, or “made from natural wood”. The packaging may use images of trees, or come in eco-friendly looking cardboard boxes. Marketing a product in this manner gives one the impression that this is a “natural toy”. 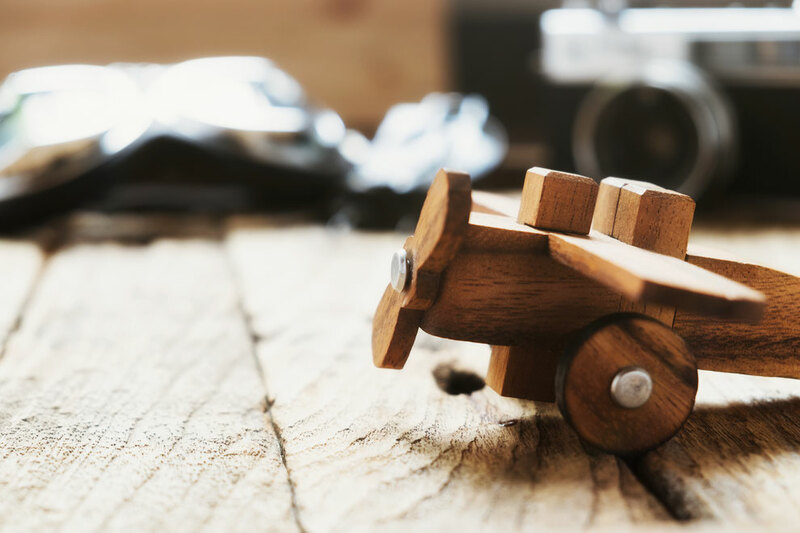 Look for toys that are made from solid wood, as opposed to pressed wood, plywood or MDF, which are much cheaper materials but require the use of toxic glue during production. This type of glue contains formaldehyde, a volatile organic chemical (VOC) which will off-gas (emit as a vapor) for a long time. This effect has been linked to several health issues including leukemia and cancer. Most inexpensive wooden toys are mass-produced in China and Pacific Rim countries where quality control and regulation are relaxed. Even some of the most trusted and reputable US toy companies have been hit with large recalls due to the toxic levels of chemicals found in their wooden toys. While wood looks nicer and may last longer, it isn’t automatically safer for your children. To protect your family, stick with toys produced in the U.S. and E.U. where stricter regulations are enforced. Also, check for toy recalls at the Consumer Products Safety Commission (CPSC). Plastic is durable and lightweight, the perfect material to make QUADRO possible. We do not treat our components with harmful chemicals. We believe that safety always comes before profit, and playtime should be a fond childhood memory. When buying a product for children, one should always use good judgement. Just because something is made out of wood doesn’t automatically make it more educational or safe. Look for information on the manufacturer’s website about the safety of the materials they use and their impact on the environment. If they can’t convince you of your children’s safety, then it isn’t worth the risk.